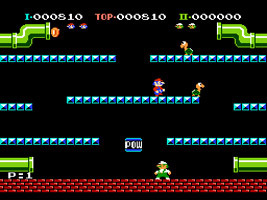 A port of the classic arcade game Mario Bros.. Mario and Luigi must work together to clear the sewers of Shellcreepers, Sidesteppers and Fighter Flies, but also compete to grab the Coins that come out of the pipes. How many phases can you clear? This port features a number of graphical downgrades. The short demos that introduced each enemy in the arcade game have been removed, and there is less variety in the bonus stages.